Overall this is a very good portable MP3 player - limited in other functions - no video playback, limited photo support as standard (it's an optional extra) etc. 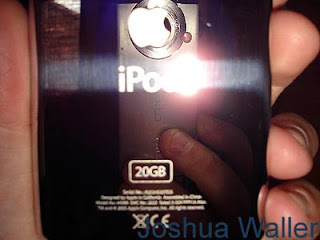 Annoyingly the design means a case is required at the same time as buying the iPod otherwise the back of the ipod and the screen will scratch very easily. 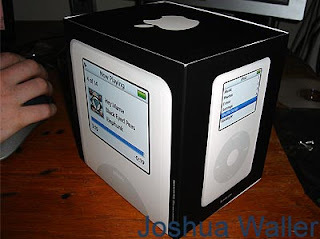 Because of the generally high price in comparison to other MP3 players from Creative etc, I personally wouldn't spend my own money on an Apple iPod. 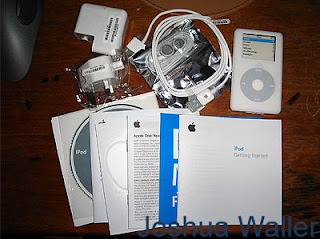 I got the 20gb Apple Ipod Colour from freeipods dot com (back when they used to exist or work) - they also sent me the firewire cable in a seperate box (I don't know whether this is normal). 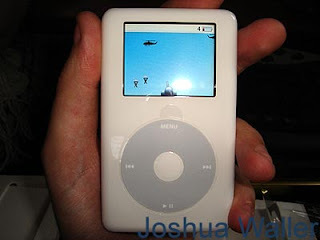 Purchasing music through iTunes (the media player that comes with the iPod) is quite expensive and limiting, as the music is copy controlled. I'd much rather buy a CD, convert it to MP3 at the quality of my choice. + 15 hours battery life apparently. + Very good bass response and sound quality from the provided apple earphones. - Silver metal back scratches rediculously easily for example, I opened it yesturday, put the ipod down on what I thought were clean surfaces, and today it's got tiny scratch marks all over the back! 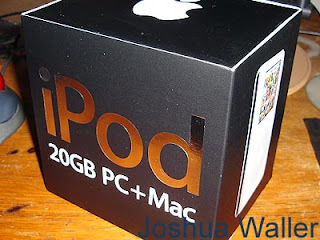 - There seems to be no way of getting the photos onto the iPod without the photos first going through a computer - You need the optional ipod camera connector in order to use the ipod as a camera backup :( - it's £20 from Apple. - Apple iTunes playback quality seems poor compared to Winamp - also tracks sometimes playback with crackles! 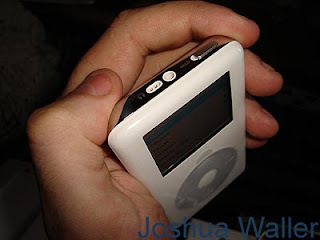 - Switch off the ipod and it'll loose you position in your playlist, this is annoying if your playlist is about 1000 songs long, and you're 250 songs through the list. - Loudest setting is too loud, distorts, especially if you use the equaliser to boost bass. - Bright white earphones and lead draws attention to you and your ipod (should be available in black as well). - Very expensive accessories whether it's a car tape player adapter (Belkin £20-25!!! ), or speakers for the ipod, they're all stupidly priced simply because they're white and match the colour of the ipod! Box contents - UK plug, and charger (USB cable), USB Cable, the white "Steal my iPod" headphones (in a silver packet), the iPod, CD-Rom, Manuals, 1 year warranty, Free music, Getting started, plus the silly white Apple stickers you seem to get with all Apple products, perhaps these are for the 10-12 year olds who buy these products?